The PARK HOTEL LAURINO, a hotel that has old traditions, has modern furnishing and is fitted with every comfort, invites you to come and spend a splendid and peaceful holiday in the hearth of the Dolomites. Situated a few steps from the skiing facilities, it is the ideal starting point for wonderful walks in the woods and the fields in scenary that is dominated by the Catinaccio Group, the Monzoni Mountains, with a view of Sassolungo and the Sella Group. 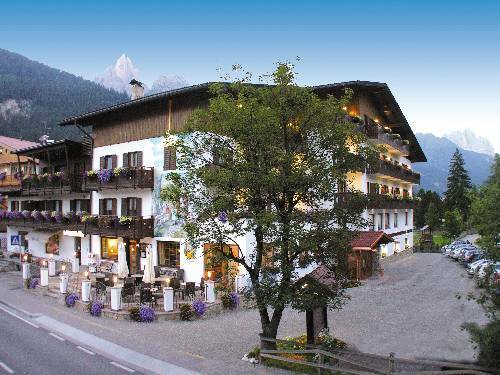 The hotel is situated in the middle of the town near the ski-lifts and all the shops, beside it you will find the play park and a splendid private park. All comodities in the house, bar, lounges, games room with billiards, lift, ski room, sauna, sun terrace, mini bus, colour TV, radio, telephone and safe, private bathroom and balcony in all rooms. Rich breackfast, choice of menu with vegetable buffet. Large car park. Acquista il tuo Skipass e lo ritiriamo noi per te.